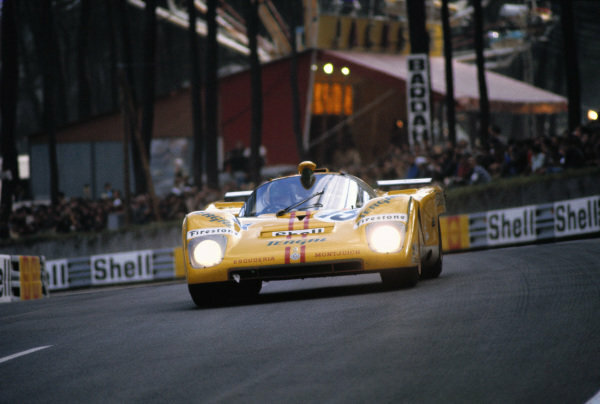 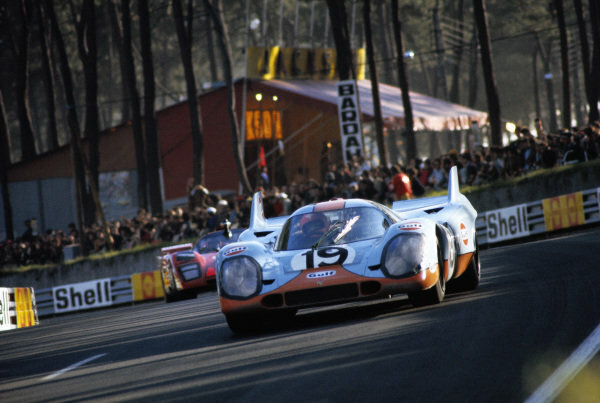 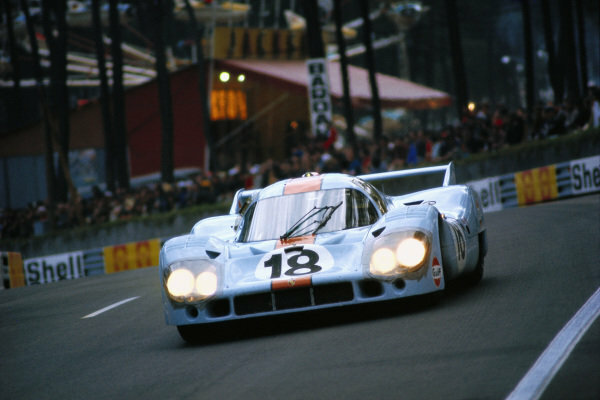 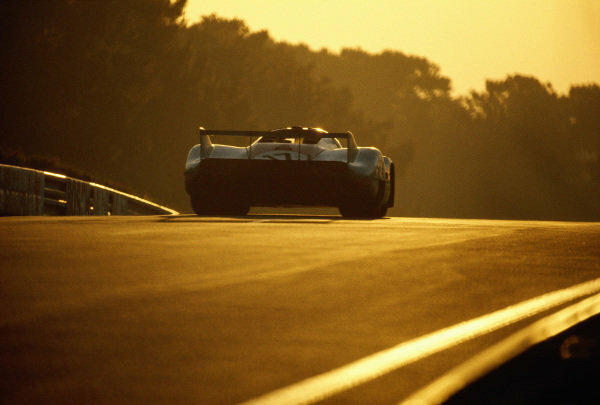 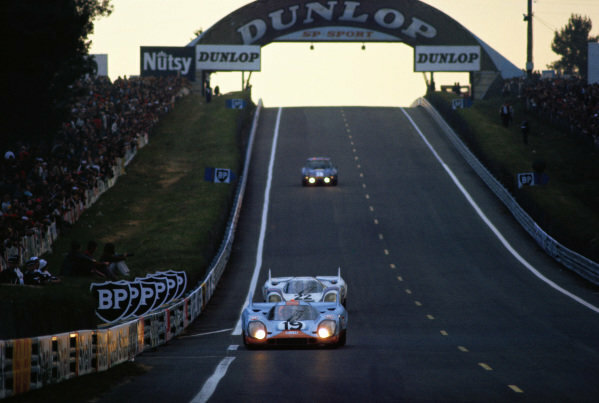 A Porsche 917K at dawn. 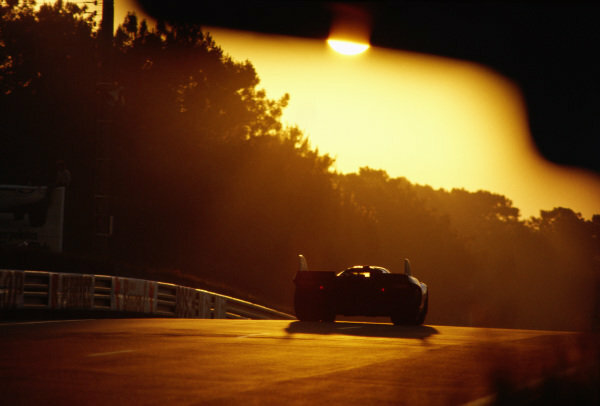 Jo Siffert / Derek Bell, J. W. Automotive Engineering, Porsche 917 LH at dawn. 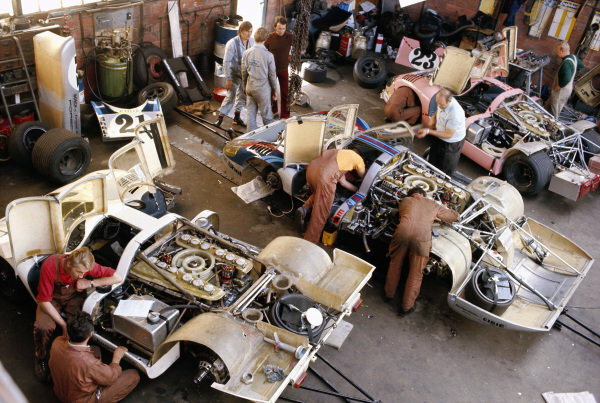 A view inside the Porsche garage with the winning 917K 053 on the left, and the retiring 917L 042 and 'pink pig' 917/20 001 at centre and right. 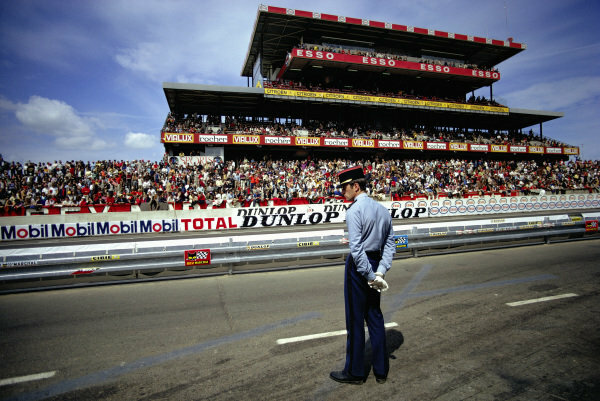 Sam Posey / Tony Adamowicz, North American Racing Team, Ferrari 512 M.
Helmut Marko / Gijs van Lennep, Martini International Racing Team, Porsche 917 K.
A French policeman guards the pitlane entry opposite the main grandstand. 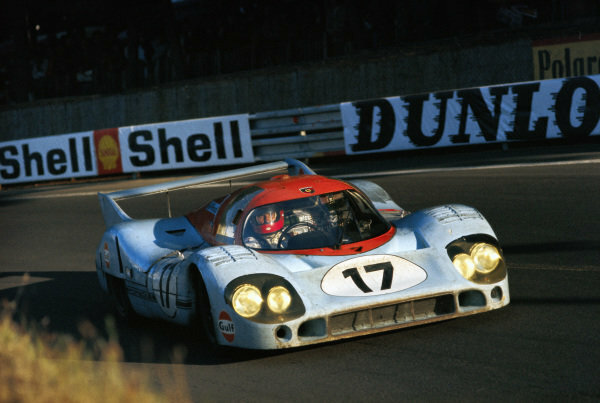 Team principal John Wyer keeps the times above Porsche pits. 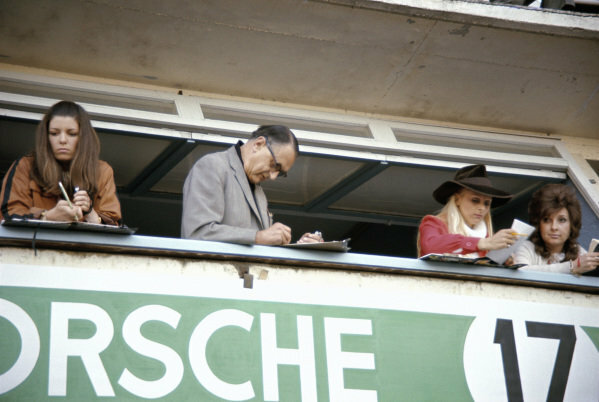 Lynne Oliver, wife of Jackie, stands on Wyer's right. 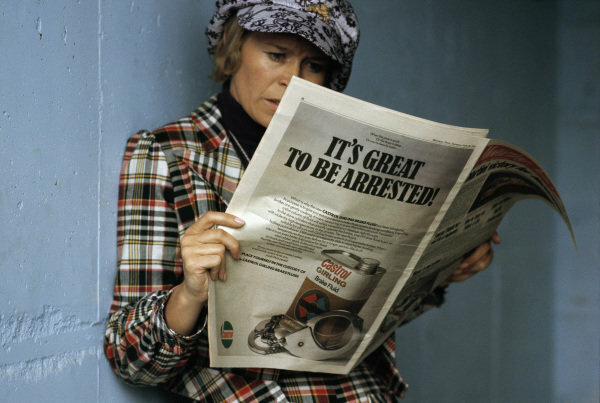 Anita Elford reads a newspaper. 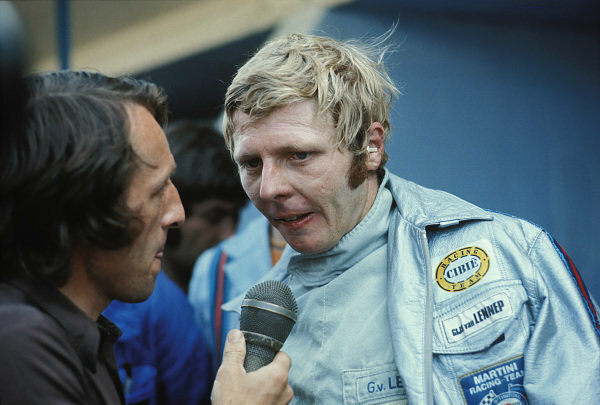 Gijs van Lennep is interviewed. 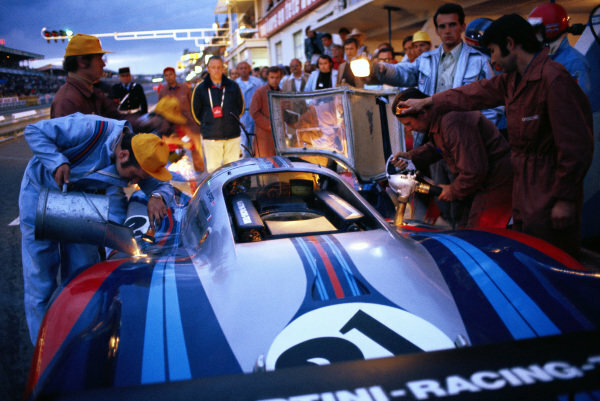 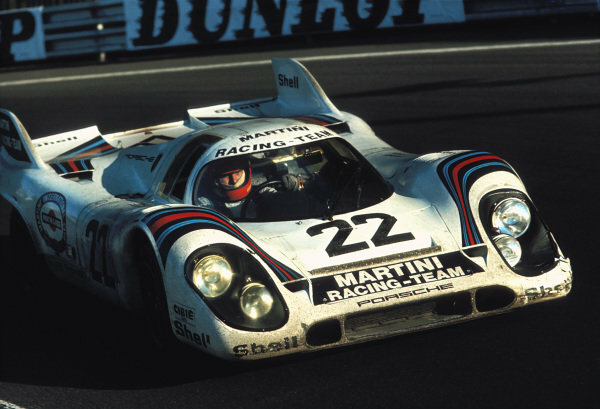 Helmut Marko / Gijs van Lennep, Martini International Racing Team, Porsche 917 K, in the pitlane. 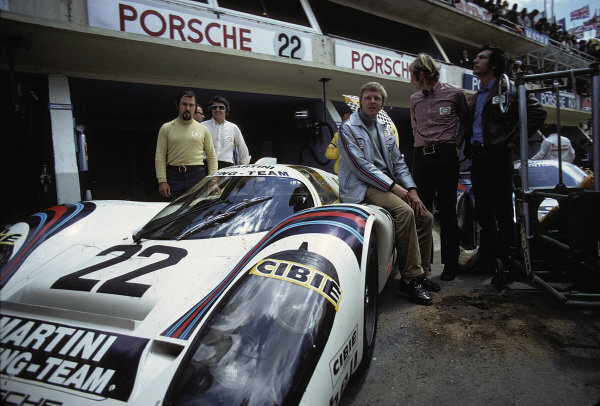 Vic Elford stands next to Marko. 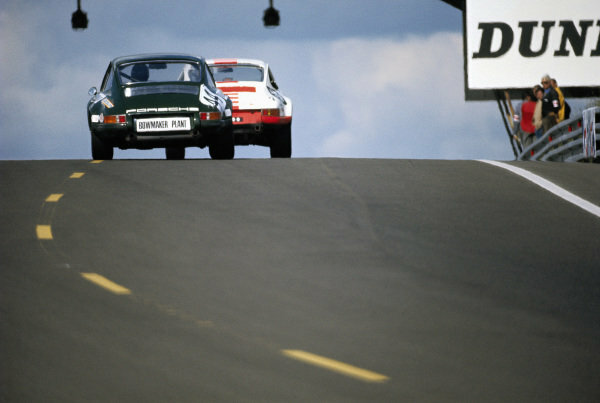 Gerard Larrousse / Vic Elford, Martini International Racing Team, Porsche 917 LH, leads Pedro Rodriguez / Jackie Oliver, J. W. Automotive Engineering, Porsche 917 LH, on the pace lap. 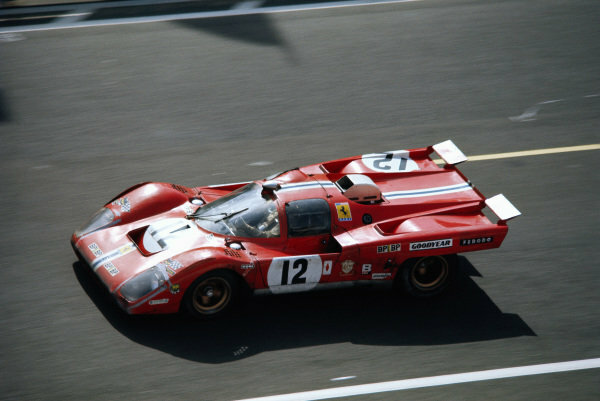 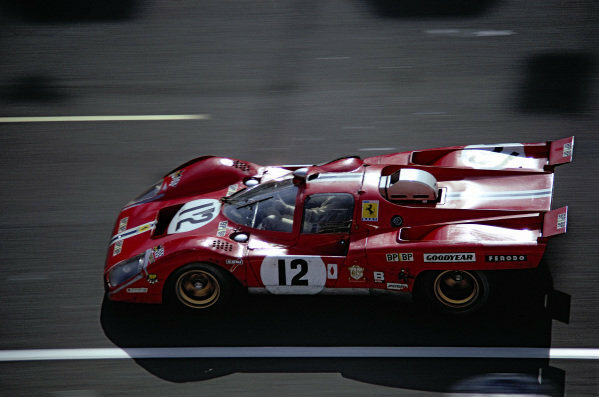 Nino Vaccarella / Jose Juncadella, Escuderia Montjuich, Ferrari 512 M.
Richard Attwood / Herbert Mueller, J. W. Automotive Engineering, Porsche 917 K, in the pitlane. 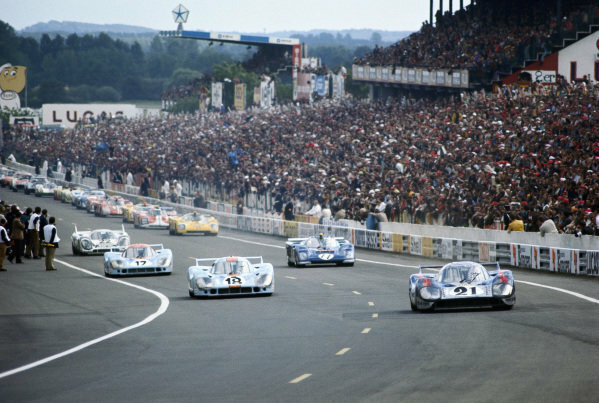 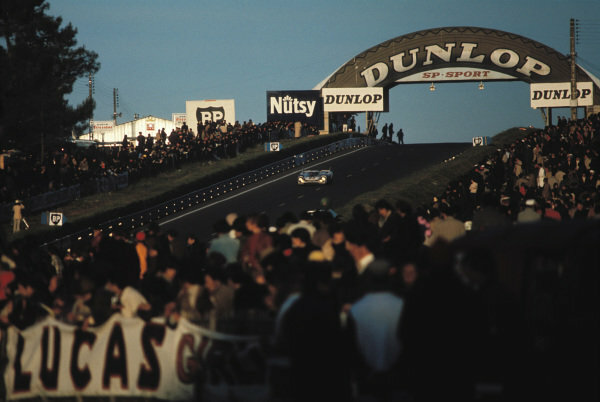 Raymond Touroul / Andre Anselme, ASA Cachia Bundi, Porsche 911 S, leads Richard Bond / Paul Vestey, Paul Watson Race Organisation, Porsche 911 S.
Pedro Rodriguez / Jackie Oliver, J. W. Automotive Engineering, Porsche 917 LH. 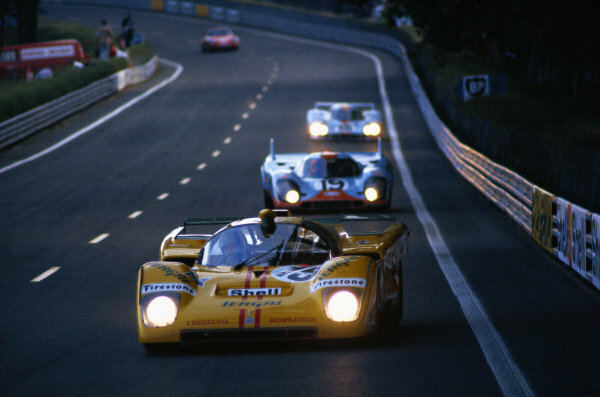 Richard Attwood / Herbert Mueller, J. W. Automotive Engineering, Porsche 917 K.
Nino Vaccarella / Jose Juncadella, Escuderia Montjuich, Ferrari 512 M, leads Richard Attwood / Herbert Mueller, J. W. Automotive Engineering, Porsche 917 K and Pedro Rodriguez / Jackie Oliver J. W. Automotive Engineering, Porsche 917 LH. 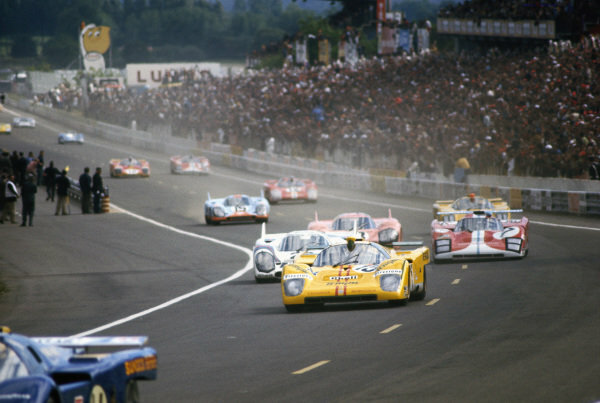 Richard Attwood / Herbert Mueller, J. W. Automotive Engineering, Porsche 917 K, leads Helmut Marko / Gijs van Lennep, Martini International Racing Team, Porsche 917 K.
Gerard Larrousse / Vic Elford, Martini International Racing Team, Porsche 917 LH is refuelled in the pits. 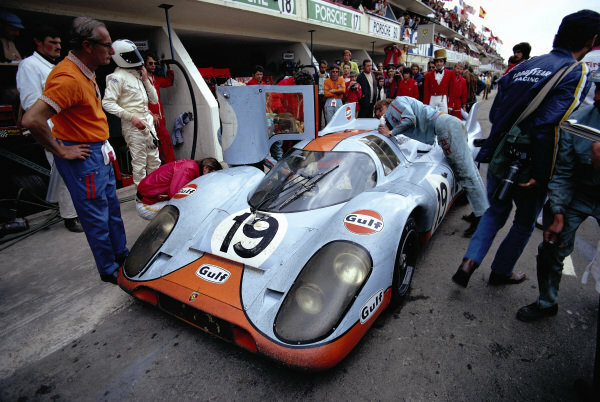 Helmut Bott, in front, observes the procedure whilst engineer Helmut Flegel holds the light. 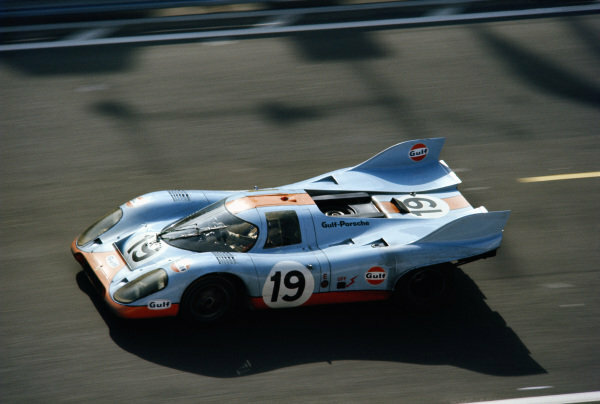 Jo Siffert / Derek Bell, J. W. Automotive Engineering, Porsche 917 LH.